​This class is specifically geared toward improving your skills on the pole! We'll work on conditioning moves created to improve your strength and flexibility. Please bring a yoga mat and a lidded water bottle. We will be barefoot for this class. These 60-minute classes are available on a 10-week session basis, a one-time class, or with an Earth Punch Card. Pole Conditioning is a seasonal class. Poleography: Want to add a little variety to your pole dancing style, while learning choreography? This class will teach different pole dance styles each week (hip hop, ballet, lyrical), and also work on a main piece of choreography over the session. This helps you think outside the box in your dancing, as well as giving you bits of choreo you can incorporate into your freestyle! No dance experience necessary. Must have completed level 3 Pole Fitness with Studio Phoenix (or a comparable level with another studio). Comfortable pole clothing recommended (with layers for warm-up). These 60-minute classes are available on a 10-week session basis, a one-time class, or with an Earth Punch Card. Poleography is a seasonal class. Bottoms Up! : Want to give your booty a lift? This upbeat class mixes dancing with exercise! We'll start with a fun dance warm-up, and then move to workouts and stretches, finishing with a cool-down. Our workouts will focus mostly on working those fabulous booties, and include some ab and leg exercises to help get your backside looking great. Please wear comfortable clothing that allows full range of movement. You can be barefoot or in socks for class. Any shoes must be dedicated indoor gym shoes with non-marking soles. Please bring a water bottle (with a lid that closes), and a yoga mat for floor exercises. These 60-minute classes are available on a 10-week session basis, a one-time class, or with an Earth Punch Card. Bottoms Up is a seasonal class. ​Do you break into a sweat when your instructor says it's time to freestyle? Do you find yourself repeating the same moves over and over? Or are you just bored, and want to try something new? Come unlock the creativity within! This class will use exercises to help you think outside the box when it comes to freestyle (non-choreographed) movement. We'll give you tools to create new movement, and to view your current vocabulary of moves in a whole new light. While this class will benefit pole dancers (and we will use the poles as an apparatus for some activities), you do not have to be a pole dancer to attend! No dance experience required.... come as you are! We'll use different exercises each class, and provide time to apply your new skills. While our studio is always a judgment-free zone, this class in particular is especially so. This is not a class for perfection! Ugly movement, awkward shapes, and laughter are all welcome as part of the creative process. There are no mistakes... only learning opportunities. Be ready to have fun and try new things! Curves Ahead is a Pole Fitness class exclusively for women who identify as Plus Size (we recommend sizes 14+). While women of all sizes are welcome in all of our classes, we know it can be helpful to be surrounded by those who share similar goals and struggles. This class is open-level, as each student works at her own pace. These 60-minute classes run once per week for a 10-week session, and are $250. Interested? Call or email us to come try a class for $35! You can register for classes online by clicking here, or contact us at info@phoenixpole.com for more information on booking a class! Please make sure to view our Policies page, as well as our FAQ page for common questions! Pole Fitness: Combining the sensuality of pole dance with the strength and flexibility of gymnastics, pole fitness is a sport that is rising in popularity around the world. Come take a twirl around the pole, and see what everyone is talking about! Spin Pole: Ready to get dizzy? Use the moves you've learned in Pole Fitness to master moves on a spinning pole. Learn beautiful combos that accentuate your movement! All ages, sizes, and athletic abilities are welcome in our classes! Our curriculum is progressive, and will slowly build up your strength. All of our instructors are certified. These 90-minute classes run once per week for an 8-week session, and are $240. Interested? Call or email us to book your first $40 teaser class. ​Our poles do not have a weight limit. See what students are saying about pole fitness at Studio Phoenix! 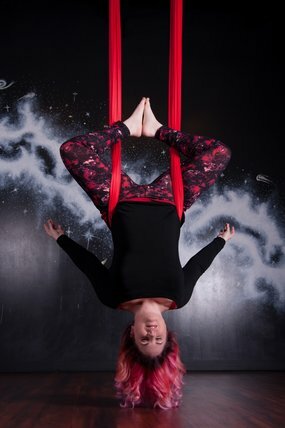 We are excited to introduce our much-anticipated Aerial Hammocks classes! Please read the important notes below for all Aerial Hammocks classes. Any student who refuses to follow the rules will be dismissed from class without refund. Aerial Yoga: Take your yoga practice to new heights! This yoga class uses aerial hammocks to assist in deeper stretches and supported inversions. Work on your yoga flow while creating beautiful shapes with the fabric. Our Aerial Yoga class is open to all skill levels, as modifications are available to suit all healthy individuals. The fabric will support up to 250lbs safely. Please bring a yoga mat, yoga blocks if needed (or they are available for sale at the studio), and a lidded water bottle. We will be barefoot for class. Aerial Hammocks Conditioning: Take your conditioning to new heights! Want to get stronger for your Aerial classes, or try something new? This class uses aerial hammocks to assist in improving grip strength, muscle strength, and deeper stretches. Our Aerial Hammock Conditioning class is open to all skill levels, as modifications are available to suit all healthy individuals. This intense HIIT class will make you sweat! The fabric will support up to 250lbs safely. Please bring a yoga mat, yoga blocks if needed (or they are available for sale at the studio), and a lidded water bottle. We will be barefoot for class. - Students are responsible for making sure nothing on their body will tear the fabric. This includes metal jewelry, exposed zippers, ragged fingernails/toenails, etc. These one-hour classes are $200 for an 8-week session, or $30 for a one-time class. They're also part of our Hammocks Punch Card System. A $200 8-punch card allows you to try both of our hammocks classes for more variety. All sales are final; no refunds. Studio Phoenix is proud to be one of the few studios in Illinois with licensed and certified Liquid Motion® instructors! Come see why everyone is talking about this movement class! Liquid Motion® is all about floorwork, so no previous dance experience is required! Beginners welcome! ​Liquid Motion® will teach you to work with your body's mechanics to move in a more fluid way. Using dance methods, we'll learn specific moves, and then how to connect those moves together. We'll explore the body's natural movement, build self-confidence, and understand the body on a higher physical and mental level. You'll find yourself paying more attention to how you move your body through space, and moving with intention. Liquid Motion® stands out from other classes because our methods apply to any type of movement, enabling students to immediately feel successful, as well as continue their education beyond class. This approach to movement makes our program an invaluable resource that provides long-term benefits, including a higher level of self-esteem, a deeper knowledge of oneself on all levels, and a stronger, healthier body that moves with confidence and grace. Knee pads are REQUIRED for this class. Dress in layers, with arms and legs covered, and wear socks. Please bring your own yoga mat. Water bottles with lids are welcome. This 60-minute class is available as an 8-week session ($130) or as a drop-in ($20). It is not part of our punch card program. Specialty Classes are available as a drop-in ($15), as a session ($80 for 8 weeks), or you can use our punch card system! ​Punch Cards have 8 punches and are good for 2 sessions. All of these are available in our online store. Please check to see if there are any pre-requisites for classes before enrolling. Chair Dance: Take a seat... then work it! Join this fun class to learn chair work and floor work. We promise you'll never look at a chair the same way again! No dance experience is required for this class. You do not have to be enrolled in Pole Fitness classes (or have a background in them), but Chair Dance will definitely up your pole performance game! These 60-minute classes are available as a drop-in basis, on an 8-week session basis, or with a Phoenix Punch Card. Click the video below to see our Chair Dance Class perform in our Spring Showcase! The performance starts at 2:10. Flex Appeal: Lacking in flexibility? This class is for you! Flex Appeal is a flexibility and contortion class that focuses on improving your bendiness and range of motion. This also helps with strength in balancing! Whether you're stiff as a board, or regularly sit with your legs behind your head, this class will help you improve. All flexibility levels are welcome, as we can modify to meet each student's needs. You do not need to be enrolled in any other classes to take this class. Pole Conditioning: This class will use exercises that improve strength, balance, coordination, endurance, flexibility, and injury prevention to support and/or supplement your pole journey (tricks will NOT be taught). You will predominantly use body weight for resistance. Expect circuit training, mat conditioning, pole fitness strength drills according to each individual's level, core crusher segments and more. You must be enrolled in a pole class with a studio (or have taken one recently), and have basic knowledge of grips, body positioning, etc. Beginner to advanced level students welcome. Class offers level based progressive exercise alternatives. ​These 60-minute classes are available on an 8-week session basis, or with a Phoenix Punch Card. 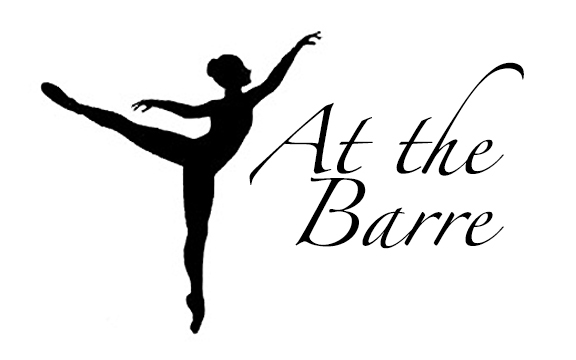 At the Barre: Do you ever miss your ballet classes from childhood? The tutus, the pink slippers, warming up at the barre, the beautiful music? Or maybe you never took classes as a child, but would like to improve your grace and poise? We are excited to announce Beginner Ballet for adults! We'll learn basic ballet, including warm-ups, barre-work, dance, posture, etc. No ballet experience required. Former ballerinas are also welcome to join us to keep their skills fresh! Please wear comfortable clothing that allows for full range of motion, and keeps your muscles warm. Leggings and layers recommended. Ballet slippers recommended... they must be dedicated indoor shoes. Please bring a water bottle with a lid that can be closed. ​Phoenix Fusion: Can you Wobble? Or Cupid Shuffle? Come learn fun line dances, while getting a great workout! This class is a fusion of dance based cardio, core-work and gentle stretching. The emphasis is on having fun with clear instructions and modifications making it accessible to all fitness levels. This one-hour class is part of our Punch Card system! Please wear comfortable workout clothes. Bring a yoga mat, and a lidded water bottle. If you choose to wear shoes, they must be dedicated indoor-only sneakers.